Today we had our first "Teaming on Tuesday," our professional learning days that offer staff an opportunity to see learning in action in short class visits followed by optional Learning Labs in the Collab Lab. Today's "Teaming on Tuesday" focused on providing immediate and targeted feedback and engaging students in their learning. 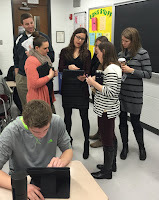 We visited the classrooms of Tom Walloch, Mark Heintz, and Rachel Barry to see how they use the Classkick app as a formative assessment tool to provide students with feedback. 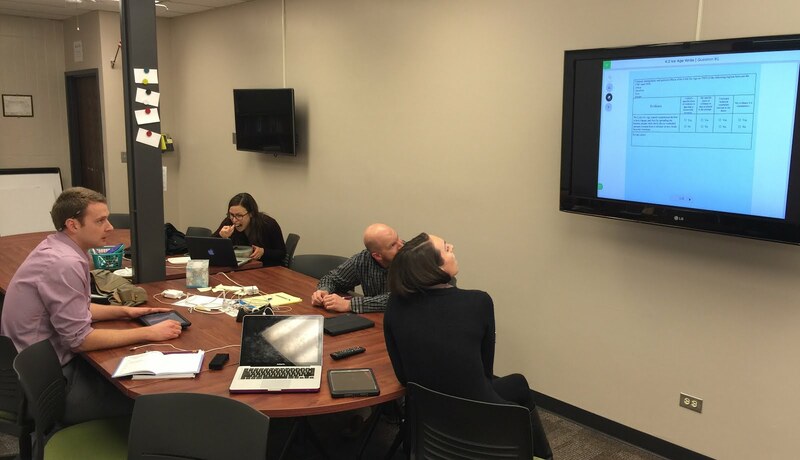 The premise of "Teaming on Tuesday" is that we meet for a 10 minute classroom visit and then come back to the Collab Lab to discuss how to use this tool and to play around with ideas for implementation in our own classrooms. 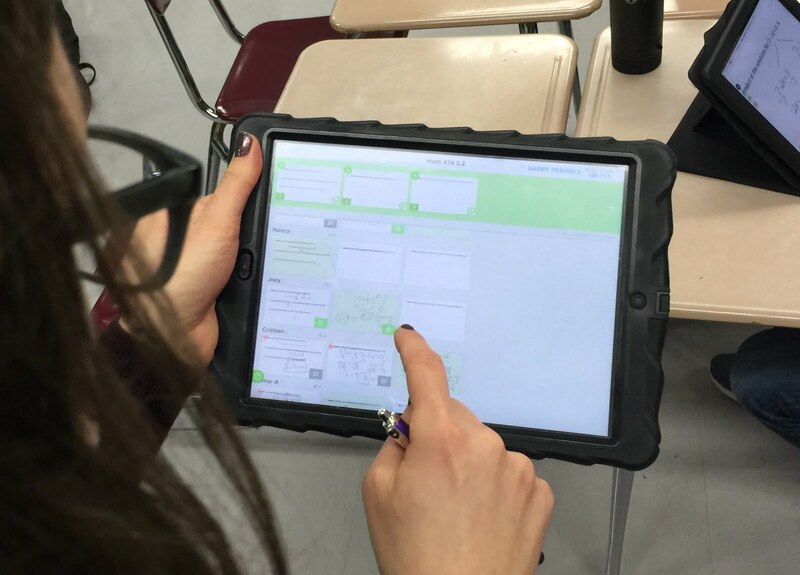 Teachers who came to observe Rachel Barry's 2nd period Advanced Algebra class agreed that Classkick is a great vehicle for engaging students during a class warm-up because students can work at their own pace and obtain frequent feedback from both their teacher and peers. After observing, we returned to the Collab Lab to experiment with the app and discuss other ways of providing students with timely feedback. Another strategy that was brought up is the idea of grouping students to work together. If students login with the same name, they are linked to the same interactive whiteboard, which allows them to collaborate on problems, ideas, etc. This idea was shared and expanded on in a later session - students could be paired up digitally to eliminate the time component of students moving to get into their groups or avoid the "I don't want to work with that person" conversation (you can assign groups anonymously). Tom Walloch also shared that he has used this for after-school review sessions by presenting the class with a code at the end of the period and telling students the hours that he would be available that night or weekend. This is a great way to allow students to collaborate with their peers (an option in ClassKick) as well as obtain feedback from their teacher. Thank you to all who participated in today's Teaming on Tuesdays professional learning day: Ami Heng, Effie Kalkounos, Dan Saken, Amy Burke, Elissa Ricchetti, Matt Snow, Kristen Guth, Izabella Wnek, Sharon Horwath, Amanda Willner, Eleanor Pattie, Mindy Perkins, Megan Knight, Quinn Loch, Linda Ashida, Kim Miklusak, and Kirsten Fletcher. We are expanding our collaboration across schools and were happy to include Matt Hamilton, ITF from Prospect, and Rudy Gomez, District 214 Technology Systems Supervisor, join us today.